Soil is a grow medium that often works with nature and decomposition to break down organic matter and fertilizer into usable nutrients that plants can feed on. Essentially, plants feed on the same stuff whether they are grown in soil or hydroponically(or aeroponic for that matter). Thus, soil microorganisms like bacteria and fungi and any nutrients provided by grower will contribute to the soil and feeding. 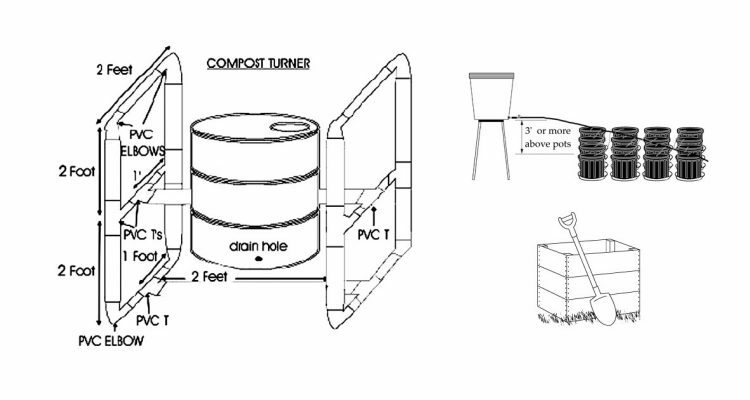 For some soil growers, they compost to rid harmful microorganisms from soil or use solarization and sterilization techniques to prepare soil. These are laborous and lengthy processes. This section covers growing with soil(without trying to offend anybody), although it is not the recommended method. To get to the point: soil belongs outside. This is not a battle cry against dirt, as many growers get exceptional results and know how to work it. But, a hydroponic grower could put a sterile, dry medium in a pot and get instant results; and more often, better growth. Growers that fear hydroponic mediums should perhaps try using soilless mix, which looks and feels like dirt. Soilless mix is sterile and contains no nutrients. Soilless mix is easier to control and easier for a beginner to just follow instructions to get good results. 1. The growth rate could be as low as half that of plants grown in a hydroponic system. 2. It is more work to move and prepare heavy soil from the outdoors while hydroponic mediums are dry and lightweight, and aeroponics uses air that needs no transporting. 3. It is harder to flush fertilizers out of soil than out of a hydroponic medium because in most cases, soil drains poorly. 4. Fertilizer costs will be higher. 5. Yield potential is higher with hydroponics / aeroponics. 6. Soil pasteurization or sterilization may be required to kill pathogens and seeds. 8. Hydroponics can be built and setup anywhere on the planet using sterile materials with precise feeding methods. Thus, you can plant and have success anytime without having to spend an effort building good soil. Quality topsoil can be purchased at a decent price. Quality dirt can also be found in quality outdoor garden topsoil, in mature forests (forest compost), under deciduous tree canopies (composted organic matter) such as alder trees, and at creek beds. Soil tests can be made with inexpensive soil test kits available at garden centers. If tests are made, it is recommended that you keep a log in order to reference how well a technique works in specific dirt. A grower can get the pH tested at a garden center for a couple of bucks, or a pH test kit or pH meter can be used to measure the pH. If this is done at a garden center, they will give you exact instructions regarding how to bring the pH up to the desired 6.5 to 7.0 range. For a grower that wants to do his own pH testing, cheap test kits are available from garden centers. Dolomite lime has a neutral pH and makes adjusting the pH to 7.0 a piece of cake. Adding lime early is important to neutralize the pH, so that calcium and other elements can be utilized later during the grow season. It takes a few months for dolomite to break down and become available to the plants. Sand, perlite, peat moss, or vermiculite can now be added and evenly mixed to loosen and aerate the soil. Perlite will allow water to drain well and is therefore beneficial for a wetter soil. Vermiculite will hold water and is good for a drier soil. Sand will help heat the soil and is good for slow-draining soil type, as it loosens up the dirt and allows for decent drainage. Peat holds water, air, and nutrients. Adding 1/3 of any of these amendments is a good idea. Adding 1/3 peat and 1/3 perlite works, too. A soil test is made with a soil test kit, or can be obtained from a garden center, to determine levels of nitrogen, phosphorous, and potassium. However, for each plant, 1 cup of blood meal, 1 to 2 cups of bonemeal, 1 cup of greensand, and 1 cup of kelp meal can be added to any size container from 2 to 20 gallons for the purpose of a backup food supply. More plant food can be added later to give a plant required nutrients. Any recommended rate of a commercial fertilizer designed for “flowering plants” applied at half of full strength will work fine during vegetative growth and flowering. Alternating a watering with plain water and a watering with fertilizer will yield half-decent results. Another option for soil is purchasing potting soil in store. Often, it is a mix that contains goodies like peat moss, lime, sand and perlite. They work fine for indoor growing. But, homemade blends with peat moss, perlite, lime and other ingredients are much more cost effective. Growers will need to implement a custom feeding program if the store bought potting soil is used. It could be done during every second watering or used similar to a hydroponic feeding program that feeds daily and flushes once a week.